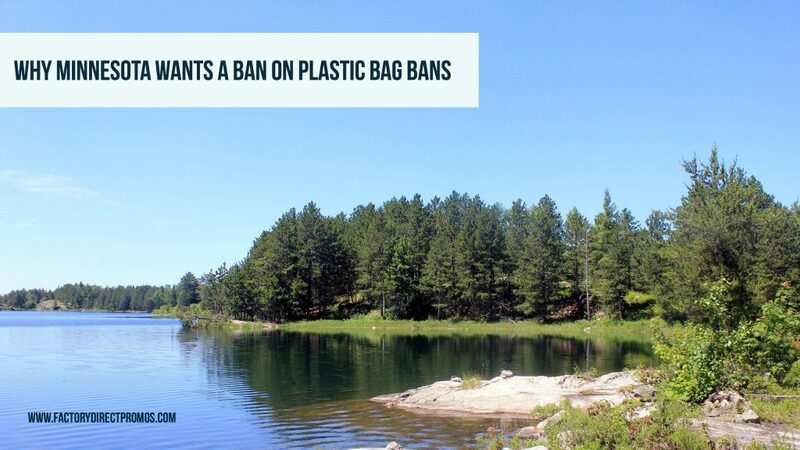 Disposable plastic bag bans are gaining visibility in Minnesota and we think that’s great. In fact, Minneapolis passed a plastic bag ban that goes into action in June. Duluth is also considering implementing a bag ban of their own. Still, some state lawmakers are not on board with this trend, and are discussing a bill to ban plastic bag bans. Although there is a lot of support to ban plastic bags due to the environmental impact, a new movement is forming in response to the state’s efforts to ban plastic bag bans. Read on to find out why Minnesota is working to put an end to plastic bag bans in their state. Single-use plastic bags are convenient. They offer an inexpensive option for retailers to give their shoppers a way to carry their purchases home from the store. Single-use plastic bags are lightweight, so they are easy to carry even when loaded up with groceries. Retailers work their expenses into the prices they charge, so ultimately shoppers are paying for the single-use plastic bags they use; however, the bags do not appear as a line item on their receipt. There is concern among retailers in Minnesota that shoppers will not be happy if they have to pay for something they thought was free before. Although retailers in California support their bag ban, retailers in Minnesota may feel that since they have been handing out disposable plastic bags they need to continue to provide something to their customers in the event of a bag ban. Any other type of bag would not be as cheap, so this seemingly would place a financial burden on retailers. When plastic bag bans are passed shoppers adjust. People get into the habit of bringing their own reusable grocery bags. Sometimes they forget, and it can be frustrating, but ultimately, life without plastic bags becomes normal. There are a variety of stores, mostly big box discount stores, that do not provide single-use plastic bags, and these businesses are doing fine and even expanding. The retailer saves money by not purchasing plastic bags, shoppers adjust and still manage to get their groceries home, and there is less trash entering the waste stream. Single-use plastic bags are made from nonrenewable resources. Those resources are natural gas and oil. As nonrenewable resources, there is a limited supply of these materials. While we’re not in danger of running out anytime soon, it makes sense to use fewer of these resources in order to make what we have last as long as possible. Plastic bag bans reduce the use of products made from nonrenewable resources. This also lessens our dependence on these resources. The majority of plastic bag bans handed out are thrown into landfills or end up as litter. This can harm the environment and incur clean up expenses. A lot of people in Minnesota are concerned about the proposed law banning plastic bag bans, because they feel the state is interfering and taking away control from towns and cities. Some people argue that if a city wants to pass a disposable plastic bag ban, or any other law that impacts their city, they should be able to do so. A state law banning plastic bag bans takes power away from local governments. We have been supporters of plastic bag bans for many years. Bag bans reduce the use and waste of nonrenewable resources. They also prevent plastic bag trash from taking up space in landfills and causing harm to animals and their habitats when they are carelessly discarded. Plastic bag bans are becoming more common with cities, counties, and even states passing bans all throughout the U.S., and the world. If you want to learn more about disposable plastic bag bans check out our map. No matter what the laws are in your city or state, marketing with reusable bags makes sense for your business, your customers and the environment. From banks to retailers and every business in between, reusable bags are a perfect way to market your business for a great ROI. For over 20 years we have been manufacturing custom reusable bags and we know a thing or two about making the process easy for you. Fill out a quote request, contact us today or get started creating your custom reusable bags HERE. Pingback: What Cities Have Banned Plastic Bags?